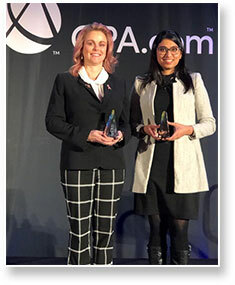 MUM alumna Jagruti Solanki received the 2018 Innovative Practitioner Award from the American Institute of Certified Public Accountants (AICPA) and CPA.com for her role as a pioneer in blockchain accounting at the CPA-led business advisory firm Aprio. “Since Aprio began working with its first blockchain client over five years ago, Jagruti stepped up and dove deep into the accounting nuances, developing best practices for our blockchain clients,” said Mitchell Kopelman, partner-in-charge of the Technology & Blockchain Practice at Aprio. In recognition of her leadership, Jagruti was promoted to partner on January 1, 2019. Jagruti was born in India and grew up in Oman. She earned a graduate degree in financial management from the Indira Gandhi National Open University, and joined MUM’s Accounting Professionals MBA in 2006. “Being on the MUM campus was the best eight months of my life,” she said. The practical nature of the program, the stress-free learning environment, and meeting lifelong friends, including her husband, contributed to her positive experience. Jagruti began her curricular practical training with Aprio in Atlanta, Georgia, and has worked there for the past 11 years. She started to specialize in the accounting and audit of blockchain and cryptocurrency five years ago, when there was no documentation or training available yet. Jagruti taught herself and, along with her team, developed best practices relating to blockchain accounting, audit, tax, regulatory, valuation, and cyber risk considerations. Today she speaks at blockchain conferences across the U.S.
What she enjoys most about working with technology companies are the learning opportunities that come with dealing with a constantly evolving field. She finds her practice of the TM® technique useful for coping with the stress resulting from the high demands of her job. 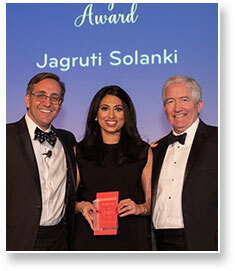 Jagruti is proud of receiving the AICPA award as a non-native woman in a male-dominant industry. 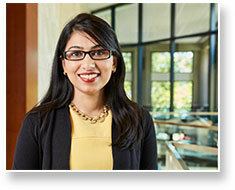 She is also eager to support fellow MUM alumni and has helped place an MBA student at Aprio.